Silver Leather Summer Sandals By Clarks Size 6. Cushion soles and very comfy. Worn but still in good condition!! Clarks Artisan Silver Sandals. UK 4 D // US 6.5 M // EU 37 Over all good condition, general signs of wear such as marks, scuffs, wear to the bottoms, small pieces of silver colour missing etc please see all photos before purchasing for a good idea of the condition. No box but they will be posted to you in a plain box to protect them during transit. From a smoke free but pet friendly home. 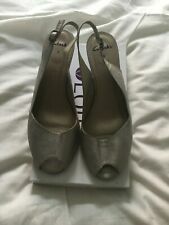 Clarks Silver Leather Wedge Sandals Size 8. Condition is Used but heels have no sign of wear. Clarks Bendable Silver Sandals Size 8 Brand New. Very comfortable as you would expect from the Clarks ‘Bendable’ range. Dispatched with Royal Mail 2nd Class. SIZE 7 D EUR 40. NO SMOKING. Gorgeous Silver Soft Leather CLARKS NARRATIVE Platform Sandals. Clarks silver leather sandals. (will send in clarks box). Lovely Clark`s Seanna rise sandals that have been worn twice and in great condition, one has quite a bit of specks on it, think this is just from storing but does not affect the look. Fab silver colour with bring a nylon soft style material with stretch. CLARKS Ladies Silver Leather Flat Strappy Slip On Sandals Mules Size 5. Very comfortable, adjustable straps. Condition is Used. Dispatched with Royal Mail 2nd Class. Clarks Silver Leather Low Wedge Sandal. Very good condition. Ladies Clarks Silver Sandals Size 6. Condition is Used. Dispatched with Royal Mail 2nd Class. Used with some scratches but with plenty more wear left. Sturdy, hard-wearing soles. Any questions, please ask. I reckon these were stolen from an alien movie set in the 60's! These are a fab pair of Clarks (feel the quality madam) ladies shoes in groovy space-age silver. We aim to improve the lives of every vulnerable child and young person in the UK. EXCELLENT CLARKS QUALITY AND COMFORT. SOFT PADDED CUSHIONED BREATHABLE LEATHER INSOLES/FOOTBED. UK SIZE 6 D.
Clarks X Christopher Raeburn Silver Salek Sun Sandals, 6. Condition is Used. Dispatched with Royal Mail 1st Class. Really cute utility style sandals, only worn twice so very little wear at all. No box but will be sent with monkey print dust bag. Have slight heel with ankle strap that closes with a clasp with a Christopher Raeburn monkey on it. Feel free to ask any questions, no returns. Heel Type: Flat. Shoe Width: Regular. Clarks Zelby Zest Metallic Silver Leather Sandals. Size UK 5.5 standard width. Euro 39. Condition is New with box. Dispatched with Royal Mail 2nd Class recorded. Wide Fit Slingbacks Peep Toe. UK 7 E EU 41. A buckle fastening allows for easy on and off. TechnologyCushion Soft. Sole MaterialRubber. Details: Funky chunky sandals. Fastening: Buckle strap. Size: UK 5. Material: Leather main. Clarks Women’'s Tri Chloe Sling Back Sandals Silver (Metallic) 6 UK .